The Athena Cinema will be hosting a free screening of first-year School of Film students. Selected works will be presented by students from their first year in the School of Film’s MFA class. Selections are made from each student’s portfolio which includes two 13-minute narrative films and one 35-minute documentary. The students were given strict parameters and budgets for their projects and acted as editor, producer, screenwriter, and costume designer. 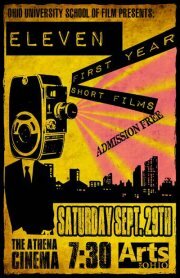 The First-Year Screening will take place on Saturday, September 29 at 7:30 p.m. at the Athena Cinema on 20 South Court St.